Sikh history originates from Nankana Sahib. Guru Nanak Dev, the founder of Sikh faith, was born in 1469.Gurudwara Panja Sahib, Hasan Abdal, Rawalpindi : Some 45 km from Rawalpindi on the main G.T road The Gurudwara of Panja Sahib at Hasan Abdal is the famous Sikh pilgrimage center and Sikh pilgrims from all over the world flock here every year in the month of April for the Baisakhi Festival. The temple situated in the center of the town depicts typical Sikh architecture and stands in the middle of a large stone water tank beside the huge stone with the large hand print of Guru Nanak.Gurudwara Dera Sahib Panjvin Patshahi - Shrine of Guru Arjan Dev (1563- 1606 A.D) Lahore : Gurudwara Dera Sahib is situated opposite Lahore Fort near Badshahi Mosque. This is the place where Sat Gur Arjun Dev Ji was martyred in the River Ravi facing the tortures inflicted by Chandu on 30th May 1606 AD.Gurudwara Sri Nankana Sahib Ji - (Gurudwara Birth Place of Sri Guru Nanak Dev ji) : Nankana Sahib is a holy place where the founder of Sikh religion, the dispeller of darkness, the most enlightened global Guru, Guru Nanak Dev ji was born early in the morning to Mata Tripta Ji and Mehta Kalu Ji on 15th April, 1469 (Baisakh sudi 3, Samwat 1526). The township of Nankana Sahib was earlier known as Raipur and later on as Rai-Bhoi-di-Talwandi but after the birth of Guru Nanak, it began to be known as Nankian Sahib/Nankana Sahib. It is situated at a distance 48 miles on the west from Lahore. Guru Nanak dev ji passed his whole childhood and young age in Nankana Sahib. Samadh of Maharaja Ranjit Singh: (1780-1839) Lahore : This mausoleum of the powerful ruler of the Sikh dynasty is situated just opposite the Lahore Fort. His Samadh occupies the spot where he was cremated. The architecture is mixture of Mughal and Hindu styles. This building was built in 1848 A.D by Kharak Singh son of Ranjit Singh. 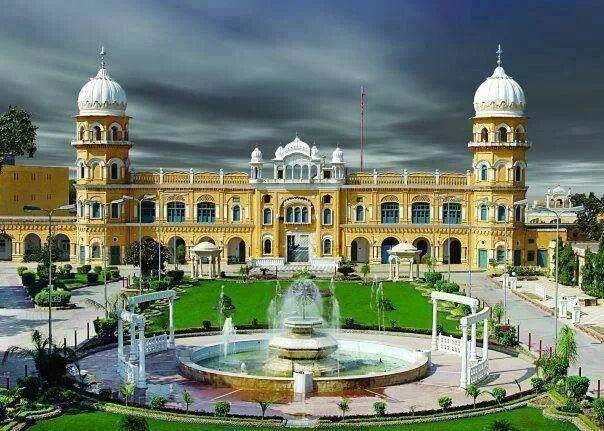 There are around 150 Historical & important Gurudwaras in Pakistan.